Hi Friends today we Will See Some Very Usefull and Free Online Virus Scanner Programs. If you don’t have any antivirus then you can check for virus and malwares online. Many online Free Virus Scanners available, We will See some Best of Them. Bitdefender is What I recommend So its 1st in My list. Bitdefender provides Quickscan online tool which will help you to Remove malwares and viruses from your Pc. 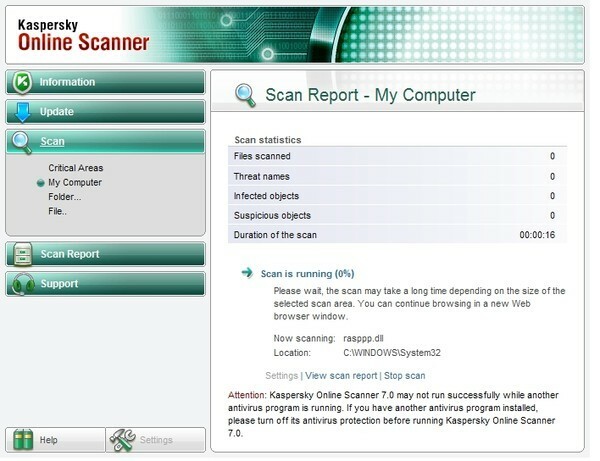 Kaspersky Online virus Scanner is one of the Best, If you Suspect that your computer May Contain Virus and malicious Files than dont wait, Just Goto Kaspersky Online virus scanner and scan for free. No need to Download Antivirus. Eset Online Virus scanner is User friendly and Powerfull Tool.ESET Online Scanner uses the same ThreatSense® technology and signatures as ESET Smart Security/ESET NOD32 Antivirus, and is always up-to-date. Panda Online Scanners scans For Viruses in your PC and e-mails. This is another powerfull Online Tool To check For Viruses. If You want to Scan a Particular File For Virus or Worms, Then This Site is best Suitable For you. All you need to do is just upload a file and Scan it. Virustotal will Do the rest of your work. Simple Steps To make your own Antivirus. ← Top Funny Google Tricks You must Know.